Report on the 2008 initiative "Towards an Asian citizens' Assembly for solidarity economy"
The initiative to foster an Asian Citizens Assembly for Solidarity Economy is a two-year project implemented by CSRSME Asia (Coalition of Socially Responsible SMEs in Asia) in collaboration with the Forum for New World Governance and the Charles Leopold Mayer Foundation (FPH) which also provides intellectual, technical and financial support. The initiative is enriched with the intellectual capital accumulated by FPH through years of reflections and collective action with various partners. FPH also brings to this initiative the methodological capital comprising of the collective intelligence that arises from the development of a new global community. This methodological capital has contributed to the reflections and actions of the partners and at the same time enriched their own contributions. World Governance and the FPH in Asia for the period 2008-2009 underscores the need to promote solidarity economy as a new economic space. It seeks to bring together stakeholders of solidarity economy from various countries of Asia to collectively advance both reflection and action for the development of a new economic space. These actions are anchored on the belief that when socially responsible citizens develop their resources, their relations and their products, it is possible to conceive a system of governance based on the principles of social responsibility of the Charter of the Human Responsibilities (CHR) which would guide their actions. The Assemblies of Stakeholders of Solidarity Economy are equivalent to the Citizens Assemblies that one finds in the lexicon of the FPH. When citizens are classified according to their stakes in the economy, they can be called producers, consumers, investors/financiers, distributors, service providers, and so forth. It is possible to estimate the investment needs of such an alternative economy, as well as the products and receipts resulting from the deployment of financial, material and human resources devoted to the socio-economic activities. What is needed is a new system of governance that recognizes and actively promotes this new economic space. a dynamic means for informing stakeholders about available resources that could address their various developmental needs. a participatory process for : (i) building up trust and confidence among partner organizations; and (ii) paving the way for concrete proposals and business transactions among stakeholders. 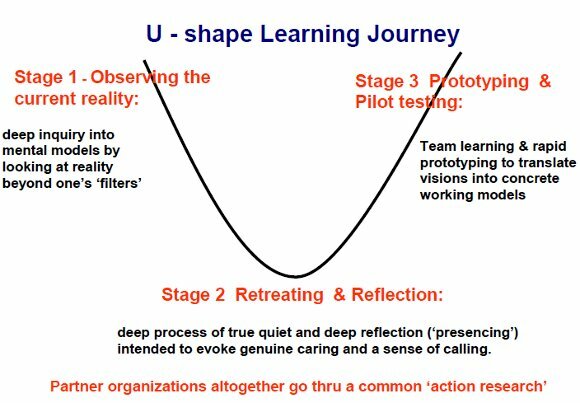 As shown in the diagram below, the Learning Journey is a U-shaped process consisting of three stages. Stage 1 - Observing the current reality, carefully and in depth (March- October 2008) During Stage1, CSRSME Asia as the Learning Journey Facilitator routinely gathered various stakeholders of Solidarity Economy in a monthly meeting to enable participants to get to know each other. At the initial meeting in March 2008, the goals and objectives of the Learning Journey as well as the rules of engagement were explained to participating organizations. A fundamental rule is that each participating organization undertakes a deep inquiry into their own mental perception of what the other organizations represent. This stage of deeper inquiry is represented by the downward sloping curve that ends at the bottom of the diagram. Each participant has to see the current reality of the other organization beyond his/her mental filters (i.e. biases, presumptions, etc.). Deeper inquiry could involve talking directly with the staff and clients, suppliers, and other partners of other organizations. It is important for the participant not only to know the company of the other participating individuals but also the partner/ supplier companies that comprise the totality of their respective supply chains. Each meeting usually lasted 4 to 5 hours. Hosting of the Learning Journey was rotated among partner organizations. At the end of each Learning Journey, the meeting Facilitator distributes small pieces of paper where participants write their answers to the question ―”What Have I Learned Today?”. The Facilitator records the Lessons Learned/ observations of participants and share these to all participants. Stage 2 – Retreating and reflecting to allow new insights and wisdom to emerge from within (September 22 and November 14-15, 2008) During Stage 2, participants move to a deep process of true quiet and deep reflection. This quiet time (also called “presencing”) is intended to evoke genuine caring and a sense of calling. Ideally, the Retreat and Reflection Stage should last for 3 to 5 days and held in a place far away from the office or work area of participants. However, not all participants could spare the time even for a full 3-day retreat. As a compromise, Stage 2 was implemented in two sequences. The first meeting called “Bayanihan Convergence Learning Journey” was held on September 22, 2008. This was followed by a two-day meeting on November 14-15, 2008. The convergence meetings looked more deeply into the focal systems and supply chains of Philippine partner organizations that have consistently participated in the Learning Journey. For each geographic area, CSRSME Asia assigned from among its staff and volunteers a Learning Journey Area Facilitator Team with at least two members per team. During Stage 3, team learning becomes especially important because the creation of alternative systems involves continuous deepening of shared understanding and clarifying visions. The Learning Journey Area Facilitator Team coordinates the workshops among stakeholders in the given area who are working on a particular focal system/supply chain. Mapping of Stakeholders of Solidarity Economy (SE): It has become the convention among participating organizations in the Philippines to classify the stakeholders of their respective focal systems/ supply chains into five (5) stakeholder groups as described below. S – Service Provider (distributors, input suppliers, professionals); P – producers (manufacturers, processors); I –investors (financing institutions, venture capitalists, funders) C – customers/consumers, clients Y – youth (young apprentice, young entrepreneurs, students) It is the task of the Area Facilitator Team to identify the individuals and their respective companies who are involved in the formation and development of SE initiative in the given area. In the aftermath of the convergence meeting of SE stakeholders in November 14-15, 2008 CSRSME Asia took maiden steps to consolidate the stakeholders into a citizens assembly called “Philippine Alliance for Solidarity Economy”. Exchange/Sharing of Knowledge & Information : Another task of the Area Facilitation Team is to document the results of the Learning Journey in their respective areas and share the lessons learned to other areas. The Web Portal currently being developed by CSRSME Asia can expedite the information exchange. Developing the market for products and services of SE supply chains. Still another task of the Area Facilitation Team is to assist the SE stakeholders in developing the market for their product/ services. Towards this end, it has been the consensus of the partner organizations that they shall jointly organize and manage an annual Bayanihan Supply Chain Conference and Trade Exhibit. The first trade exhibit of SE stakeholders was organized in conjunction with the meeting on November 14-15, 2008. Upgrading of knowledge and skills of human resources: Finally, it is also the task of the Area Facilitation Team to conduct and/or arrange training workshop sessions for the officers and workers of SE stakeholder organizations. An important aspect of the training sessions is the raising of awareness of SE stakeholders about the ethical/ social, and environmental standards that may be applicable to their respective products/services. the approaches, modalities, and instruments for mobilizing socially responsible investments (SRIs) to support the development of RPSE enterprises and supply chains in developing countries. “Solidarity Economy, World Governance and Citizens Assemblies: Reflections on three pillars on which to build the world’s future”, by Gustavo Marin, Director, Forum for a New World Governance, and Program Coordinator, Charles Leopold Mayer Foundation. “Ever Considered an International School for Solidarity Economics?”, by Ed Canela, International Training Coordinator, CEFE International. “Fair Housing Project”, by Brigido Simon, Jr., President, Bumbaran Development Corp.
“Kairali TV (India)”, by John Brittas, Chief & Managing Director, Mayalayam Communications Ltd.
Three workgroups facilitated respectively by John Samuel, Gustavo Marin, and Ben Quiñones assembled some pertinent lessons derived from the workshop papers, presentations, and deliberations. A general consensus was that solidarity economy (SE) initiatives exist in various countries of Asia, but the literature about these initiatives is scarce. The cases presented provide anecdotal evidence of SE initiatives. They do not as a whole give a comprehensive view of SE in Asia. There was realization of the need for a systematic documentation of cases of SE initiatives in various parts of Asia which ultimately should be disseminated to a broader audience globally. The workshop participants saw the need to “put the horse before the cart”, in a manner of speaking. With so many actions that need to be done in the mapping, analysis, and development of SE initiatives in Asia, the workshop participants realized the need to set up a regional network of SE stakeholders in Asia in order to ascertain the governance structure and direction of such a network. It was the consensus to call this regional network the Asian Alliance for Solidarity Economy (AASE). As a new regional network, AASE should be a self generating revenue model and not another network that is dependent on donors. Vision: AASE is the Asian hub of a (RPSE) responsible, plural and solidarity economy. reach out to various RPSE stakeholders in Asia and other regions of the world with internet enabled information exchange and experience/ expertise sharing In plain words: “If you don’t have the chord to plug, AASE can help you develop the chord. If you don’t know where to plug the chord, the alliance will show you where to connect it”. Goal : To achieve its Vision and accomplish its Mission, AASE has to strengthen its focal system in the area of systematization, compatibility and wholeness. The goals of AASE for the next 3 to 5 years are therefore geared towards the development and efficiency enhancement of its focal system. International Institute of Solidarity Economu (IISE). IISE shall also serve as the Knowledge Forum of the alliance. It shall bring together academicians who study alternative economies, and solidarity economy in particular. IISE shall offer Masteral and PhD courses on Solidarity Economy. Courses on Governance can be integrated into its curriculum. Revenues of IISE can be sourced from contributions or fees of students. Asia- Pacific Solidarity Invest program (APSIP): APSIP shall also serve as the Investors Forum of the alliance. APSIP is a clearing mechanism for channeling investments, funds, and other resources in support of sustainable SE initiatives. Organizations providing these kind of resources can be encouraged to become APSIP partners. Inasmuch as resource organizations already have their own guidelines for choosing their partners, the value-added of APSIP lies in its capability to identify and evaluate sustainable SE initiatives. 3. Asian Forum for Solidarity Economy (AFSE). AFSE shall also serve mainly as the Practitioners Forum of the alliance. AFSE is a forum of entrepreneurs and businessmen that are interested to learn and replicate the methodologies develop by the AASE and to those who wants to collaborate in it. The next Asian Forum will be held in Japan in November 2009. PARC (Pacific Asia Resource Center) will be the host organizer of the Asian Forum 2009. 4. AASE Web Portal. This is also known as the Communication Forum of the alliance. The Web Portal is a tool for information exchange and dissemination. All reports and relevant information of AASE will be published in this website. While AASE facilitates the organization and conduct of the above forums in Asia, it shall actively promote inter-regional or inter-continental dialogue. In particular, AASE shall encourage international SE networks to conduct at least one of their regular workshops in Asia in collaboration with AASE. This will enable international SE networks to bring their members in Asia and interface with their Asian counterparts. AASE can serve as an Asian Citizens Assembly composed of various SE stakeholders. The Citizen Assembly provides a platform for Solidarity Economy. Stakeholders can come together and upgrade information, skills and pool faculties. The Citizens Assembly can also equip stakeholders with innovative tools and approaches to transact in the market for the common good. It was the consensus to adopt the CSRSME Asia classification of SE stakeholders for a start. This refers to the SPICY classification as follows: S–Service Providers; P- Producers; I – Investors; C- Consumers/clients; and Y –Youth. The Philippine model of Citizens Assembly was mentioned where SE stakeholders become members of the Bayanihan Supply Chain Stakeholders Assembly. Develop a Citizen’s Assembly calendar of activities that will provide a wider spectrum for inter/intra forum dialogues. Establish Citizen’s Assembly in different countries of Asia to facilitate and reinforce the links among all Solidarity Economy players including those involved with the Asian Forum 2009 in Tokyo, Japan. New knowledge and awareness network within formal and informal institutions. The main task of AASE in the initial years is to identify/ do a mapping of SE initiatives in Asia and to make an in-depth analysis of these initiatives. A simple framework can be adopted for identifying and analyzing SE models. An SE model should be able to capture the real situation in the field that shows solidarity. To identify such model, a general mapping of SE initiatives should first be conducted. The Learning Journey adopted by CSRSME Asia is one practical and less costly approach to SE mapping and to identify which model should be the subject for case study. Another approach is through the AASE Web Portal where SE stakeholders can post their experiences so that others will have something to search and see what is happening in the different parts of the world. It is important to consider in identifying SE models for case study the values inherent to SE initiatives. There should be a solidarity that is based on cooperation and not competition. There should be a democratic kind of economy where participants are stakeholders. Whether it is a group of workers, consumers or a community, studies should include knowledge, leadership, various operating systems, skills and new technology-innovative technology. While on the political context, the study should also look into the policy, culture and history. Inquiry should be made into the performance of SE initiatives in terms of increasing the income of their beneficiaries, their contributions to job creation and to social development as a whole. SE initiatives should contribute to social capabilities towards increasing the assets base of members of the community. They should increase the capability of SE stakeholders to transact in the market. Instead of paying the market price of 300 Euros per day, a solidarity price of 100 Euro could be paid to the case writer. In this manner, the case writer contributes two thirds (2/3) for solidarity and gets paid for one third (1/3) of his/her time. publications/books that contain the perspective of conceptual thinking of thinkers and actors including noted economists who will be invited to write. The issue of how to value the contributions of voluntary work was raised. It was suggested that the governing council of AASE should clarify the parameters for valuing the voluntary contributions of partners when they engage in AASE activities such as conducting case studies. Within a year (2008), CSRSME Asia has put into motion all the tasks stipulated in the project document that serves as a basis for its collaborative partnership with the Forum for New World Governance and the FPH. It started with prototyping in the Philippines of basic focal system that would be adopted into the AASE. This focal system consists of 4 sub-systems, namely: the International Institute of Solidarity Economy (IISE), the Asia Pacific Solidarity Invest Program (APSIP), the Asian Forum for Solidarity Economy (AFSE), and the Web Portal. Among these four sub-systems, AFSE and the Web Portal are in a more advanced stage of development. The operational details of IISE and APSIP still have to be worked out. To address this concern, CSRSME Asia is organizing another workshop in Kuala Lumpur, Malaysia in March 2009. Furthermore, the officers and operating staff of partner organizations have to be trained on how to make use of these sub-systems for their own benefit. CSRSME Asia has scheduled a training workshop in June 2009 for this purpose. Another urgent agenda is the process of legitimization of AASE. At the regional workshop in Bangkok in October 2008, participants looked up to CSRSME Asia to facilitate the legitimization process. An immediate step undertaken by CSRSME Asia towards this end is the registration of the name “Asian Alliance for Solidarity Economy” with the Securities and Exchange Commission of the Philippines. At least the name is formally registered in one Asian country, which provides legitimacy to the name of AASE as may be referred to in the process of communications among partner organization. Of course, another relevant step is the setting up of the AASE Web Portal as an interactive website. The four sub-systems of AASE will be featured in the Web Portal under “Forums”. SE Stakeholders and partner organizations will be recognized and classified accordingly under “Networks”. The volumes of papers and presentations gathered by CSRSME Asia through the Asian Forum 2007, the Learning Journey, and regional workshops will all be uploaded in the Web Portal. Preparations for the Asian Forum 2009 are underway with the coordination of PARC as the host organization. CSRSME Asia continues to actively promote the Asian Forum among its international partner organizations. CSRSME Asia also serves as a clearing house for the thematic issues for discussion during the Asian Forum. It is hoped that the Asian Forum 2009 will endorse AASE as the hub and governing body of SE initiatives in Asia. With the formalization of AASE organization and governance, it will be better prepared to participate in the Asian Citizens Assembly in 2010 in India. Report on the 2008 initiative "Towards an Asian citizens assembly for solidarity economy"
The Asian team created a new webpage dedicated to the Asian Assembly, have a look !